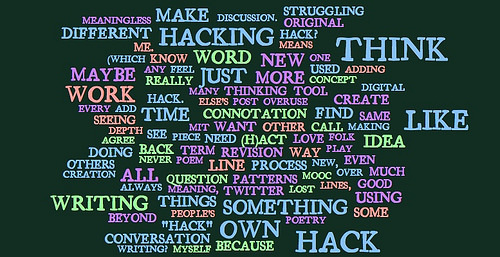 I suspect that if I told some of my computer programming friends about what the Making Learning Connected MOOC was up to this past Make Cycle with the “hack your writing” theme, they would get a chuckle, and tell me, “That’s not hacking.” Remixing poetry, shaping odds and ends of writing, moving words into image …. that’s just … writing, right? My computer friends would probably be more narrow in focus, with the act of hacking being working with the code of programs or the inside workings of a computer/network. Check out this discussion that Terry started in our Google Plus community, in which many of us grappled with the terminology of “hacking” and what it is that we were doing. First of all, this kind of rich, thoughtful discussion is exactly why the CLMOOC is so important to us as teachers. Second of all, it surfaces the confusion that many of us teachers and writers and learners are feeling as the idea of composition is in the midst of a pretty sizable shift. In some ways, we are slowly returning to this idea of the positive hack (I think/I hope). Look at the Hack for Change movement. You may even have a chapter near you, where programmers, educators, social service agencies, and local government officials spend a weekend identifying problems that need addressing, and then working together as a team to solve them. We have a group in our area, and I have had members come talk to students about what they are doing — about using programming skills and computer know-how for the good of the larger world. “Hacking” certainly has a cool cache with kids, too. When I tell my sixth graders that we are going to “hack” some websites with Mozilla Webmaker X-Ray Googles, there is a real excitement in the room. They imagine themselves going on some covert operation, dipping into the code of websites, and being a bit nefarious. Of course, I pop their bubble a bit, explaining that we will be hacking websites only through a layer of hack (X-Ray Goggles does not change the original) as a way to understanding some basic coding and to write from a different point of view (such as, revamp the front page of the New York Times and give stories a slanted view of the world – change the lens). What concepts bubble up when you “hack writing”? So, this Make Cycle, I was on the look-out for collective hacks within CLMOOC — ideas that would draw the community into the shared experience, to tap into the groupthink knowledge. I even instigated a comic remix activity that was interesting to watch unfold. I wish there had been more ways to get us to write together, to remix together, to hack together … but I know, too, that being in the midst of the change (such as that which writing/composition is undergoing right now with the digital world) is like holding on to an umbrella in the midst of the storm — sometimes, it takes all your strength to keep the umbrella from flying away … you don’t have time to offer a dry space to your neighbor. I write all this inquiry in a positive light, and I am thankful for the facilitators (Mia and Erica) for all that they did to get this Make Cycle in motion and how they nurtured these discussions along the way, in forums and in the Make with Me hangout, Twitter chat and more. We won’t even be able to understand the change unless we get into it and play, and reflect on it. This is the heart of Connected Learning — both the act of trying something new and the connections with colleagues to understand a difficult topic, as well as following our own passions. We may not yet have the right words for what we are doing when we “hack writing” and remix our words, but it is through the “doing” that we can come to better understand the possibilities of what’s ahead of us.